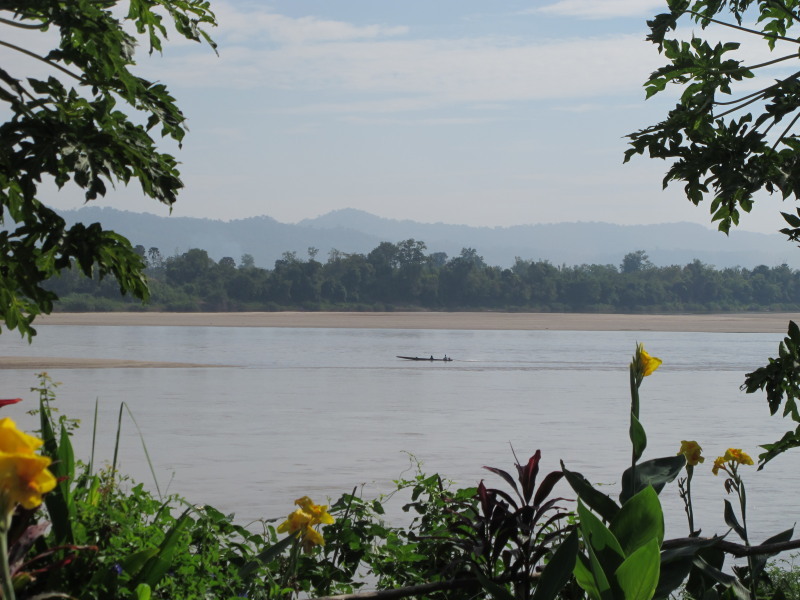 Overcast again at the rise, so I watched the long-tail boats coming and going, motoring across calm, misty waters, to and from Laos. There was more river traffic this morning, but whether it being Sunday had anything to do with that I didn’t know. I would ask Dtoy. Crossing for breakfast I encountered her stalking a duck that had been hanging around for a few days. It was on the handrail of the footbridge when I arrived from Chiang Khan and I assumed it was hers. Apparently not. Maybe it was sick? “Duck soup,” Dtoy was thinking. But when she approached, it flew away. It landed on the river bank underneath the footbridge, out of reach. Apparently, Dtoy’s daughter was meant to be serving breakfast, but she was nowhere to be seen. ‘Daughter’ eventually emerged. The French toast and fruit salad (B65) was a large, tasty serving and more than made up for any delay. The coffee I concocted was less successful – I added carnation milk to the Nescafe in an attempt to improve it, but overdid both ingredients, ending up with a bitter-sweet caffeine cocktail that was more Molotov than morning heart-starter. A combination of this and last night’s chilli had the internal machinery rumbling, and me rushing to the loo three times in quick succession. Dtoy thought the river traffic was just for the market. I asked her where locals went on a Sunday and she said, “Everywhere.” Meaning, I presumed by her tone, ‘nowhere in particular’. “And anywhere – to the temple?” I asked. “Yes, to the temple.” She didn’t elaborate further. With nothing special to investigate I caught up on this journal. 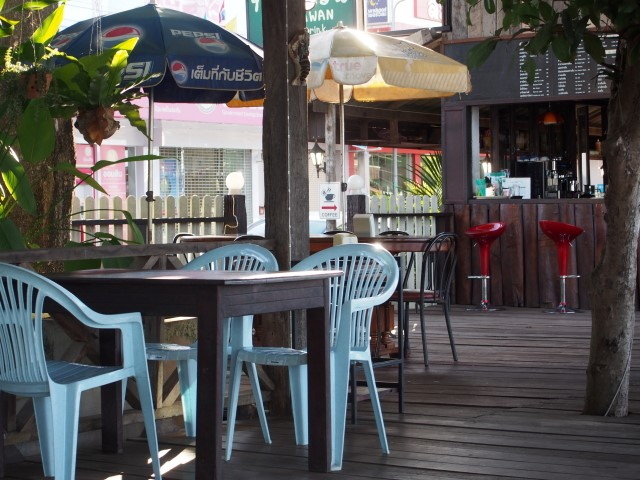 In the early afternoon, I found Kettel in the restaurant, packed-up and sitting it out until the 4pm bus to Nong Khai. He was waiting for someone to arrive so he could order lunch, but he eventually gave up on that and scurried off into town instead. I tried my luck a little later and encountered Dtoy and hubby returning in their car from Tha Bo, and unloading plastic bags bulging with fruit and vegetables. The Tha Bo market and town is more substantial than Sangkhom’s. She also proudly revealed a new phone handset. Their other one was ten years old, but seemed okay to me. 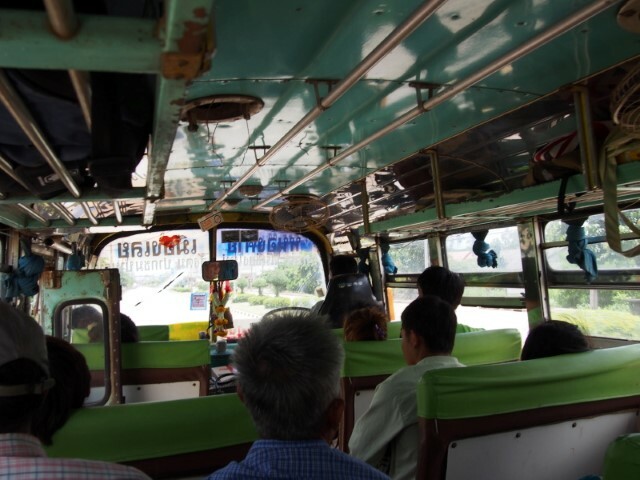 That Dtoy owned a car had me thinking how much Thailand had changed since my first visit in 1985. Then gathering enough for a bus fare would have been difficult enough for some Thais. They’re becoming consumers just like us in the West (an observation, not a judgement) – though Thais have always liked shopping, it’s just now they have more access to money. And even though they’re being westernised, they’re still protected, to various degrees, by Thai language and culture. I finally got my banana shake (B40). Kettel returned and had a pineapple fix, keeping true to his commitment to eat as much of them as he can, in whatever form, because they’re a luxury item in Holland. Bananas are usually cheap in Australia, though not at present, following damage to plantations in Queensland – I just like bananas. Kettel bid farewell, though I was intending to go for a walk around town, and said I’d probably see him again at the ‘bus stop’, which was anywhere on the side of the road (though there is a semi-official stop near the market). Sure enough, as predicted, I encountered him, but on the wrong side of the road – not because he was confused and thinking himself back in Europe – he claimed he’d get a better view of the bus when it approached. Though you’d hardly miss it given its rustic appearance and the tooting it does. We chatted until it arrived then shook hands and said farewell, again. A photo I prepared later, the bus from inside. Sunday was like any other day in Sangkhom, except quieter. I was the only customer at Tantawan. My laptop still couldn’t parley with their WiFi, and Microsoft’s troubleshooting ran me around in forlorn circles. Gave up. 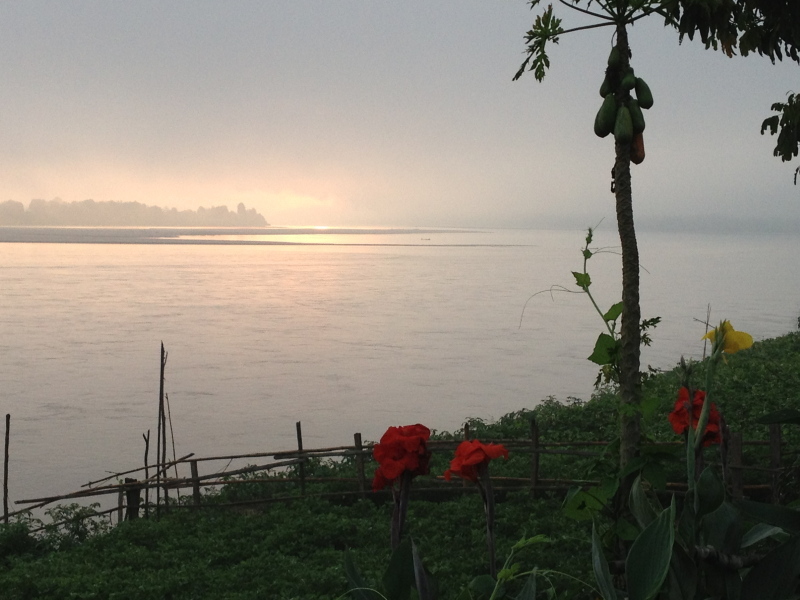 Had and Americano (25B) and engaged with the passing Mekong instead. A group of Thais arrived as I was leaving, but I expected to see more out-and-about enjoying their day off, though I guess locals don’t do it, or might’ve ventured up to the temple on the hill behind town, and Sangkhom hasn’t become a real visitor destination yet or, more precisely – again (it was once a backpacker hotspot, as outlined in a previous post). 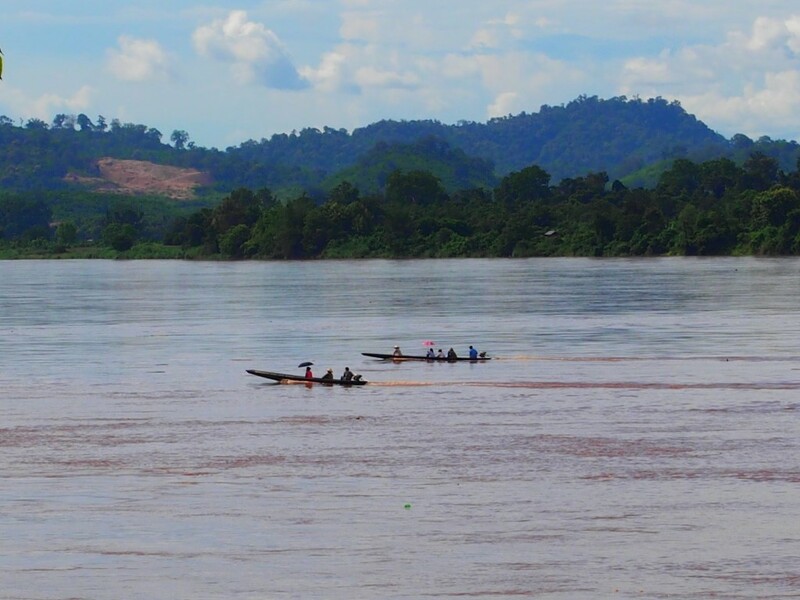 A view from Tantawan – though the pic was taken later during the wet season. I returned to Bouy, grabbed a big Chang from the fridge and took it to the bungalow to consume while watching the last sunset over the Mekong, even though I was looking east to Laos (same-same, but different), and, of course, I mean my last sunset – the Mekong will keep meandering under the sun’s glow long after my departure. ‘Chang’ means ‘elephant’ in Thai, and I finally figured out why the amber version is also elephantine in nature – it packs a wallop – looking more closely at the label revealed the ‘Classic’ alcohol content – 6.4%! The ‘Draught’ is lesser elephant juice at 5%. I grabbed a bottle of that next time. Strangely enough it didn’t seem to taste as good, but that’s probably placebo effect, and didn’t stop me having another bottle with a meal of fried vegetables, tofu meat and cashews, accompanied by khao suay ‘beautiful rice’. 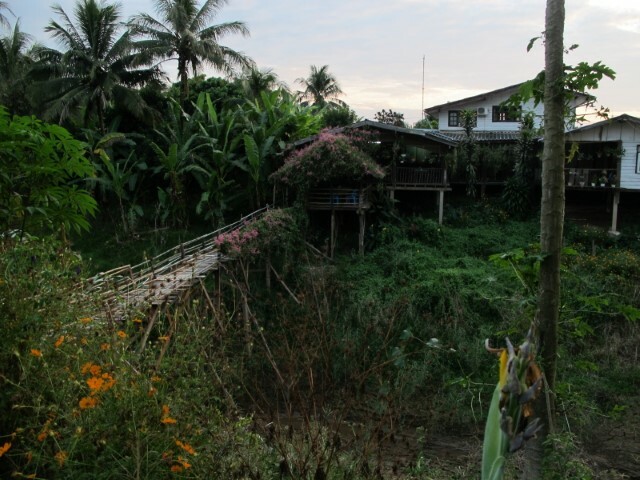 There were few people staying at Bouy’s now – an American couple had the largest bungalow, which was at the far end of the island from mine, though I rarely encountered them. I forgot to ask Dtoy about the duck, but I never saw it again – though, nothing resembling waterfowl soup was on the menu either. 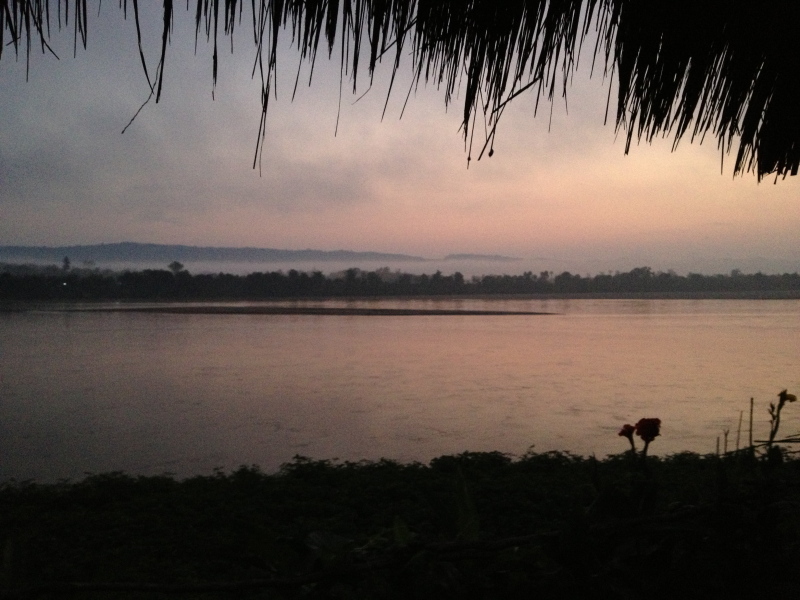 I retired to the bungalow to soak up a little more Mekong magic. Hit the sack at 8.30pm! Note to forgetful self: drink more water between beers. Aah, paradise – with a dose of dehyrdration.